First, a touch of an apology. I'm truly sorry for the minor absence on my part. I have kind of been in some strange "funk" lately. I am still not sure what exactly happened, nor do I want to bore you all with details.. But I think I had a little bit of a shutdown period. BUT. I feel like I'm getting myself all rebooted up.. and I'm ready to join my regular life again aka blogging. I knew there was something really "off" with me when I was wearing the same horribly chipped nail polish for 3 days. Whenever I get a chip, it is immediately off when I return home. Finally, going in to day 4, I was like 'ENOUGH!' and rectified the situation. I did do a nail look that was awesome, but I didn't even photograph it. I will have to do so again soon. It was using some gems that Silver sent to me. Once I use one of the gorgeous polish she sent me (again) - I will do a full post! So.. sometime this week! Saturday night.. during one of my study breaks, I decided to cut my nails riiiight off. I decided that after snapping out of my "funk", I should do a proper restart with my nails. Clipped right down. It always makes me really, really happy when I have super short nails! Less chipping. I didn't know what I wanted to use.. and I didn't really want to not be studying (re: cramming) for too long. Then I remembered that I had a couple of polish in my untried drawer. 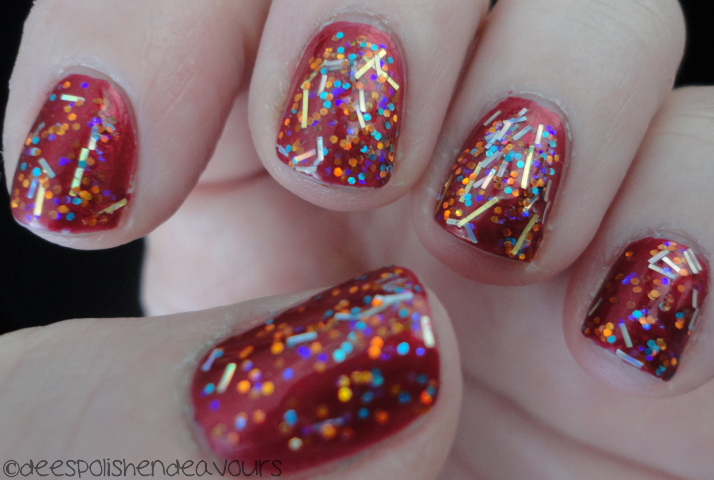 Snapped up China Glaze Cranberry Splash and Rainbow Honey Frozen Flame. Yes and yes. Side note: My hands are EXTREMELY dry these days. I put lotion on at least 10 times a day, cuticle butter, and I even wear my special medicated (eczema steroid cream) at night, with gloves, and they are still unbelievably dry. I am probably dehydrated. I so apologize for that. GROSS! I really wish I would have snapped a photo of Cranberry Splash on its own. It is exceptionally gorgeous. I have been lovvvving red polish lately. I am glad I got this and With Love from the Holiday 2012 collection. They both make my smile. I used two coats of Cranberry Splash (even though one coat would have worked just as well) and followed that up with two coats of Frozen Flame. Love. They are very festive feeling. I like it. I got China Glaze Cranberry Splash HERE & Rainbow Honey Frozen Flame HERE. Talk to you all again soon!! Welcome back! Sometimes those little off periods happen right! This mani is cuute! Ohh, The Weather Outside Is Weather!